← Are You Wasting Valuable Energy and Money? Many of us want to give to charity but it isn’t always possible to give money when you’re struggling financially yourself. This doesn’t mean that you can’t demonstrate your support in other ways. If you have a few hours spare in the average week, why not volunteer your time to a local charity close to your heart? It’s not just a one-way street – volunteering can have some bonuses for you too. Experience: Voluntary work can be added to your CV as work experience, which can be especially helpful if you’ve got gaps in your work history or want to gain skills for the first time or in a new area. Many people get involved in volunteering while job hunting to keep their CV fresh and up-to-date while they’re out of work. The feel-good factor: It can be very rewarding to feel that you’re doing your bit to help a particular charity achieve its goals. The majority of charities rely heavily on volunteers to perform behind-the-scenes roles and while tasks like admin and reception work might not sound very glamorous, they’re often vital for successful day-to-day running of an organisation. If you’re interested in volunteering, there are a couple of ways that you can get the ball rolling. Direct contact: If you’ve got a particular charity in mind, try contacting them directly and see what their needs are. In a small charity, it may be a case of agreeing to plug a gap in their needs and if size and space is an issue, they may not always be able to take on new volunteers right away. Volunteer agencies: If you’re not so fussed about where you volunteer, your best bet may be a volunteer agency. They have volunteer centres across the country and can match you up with volunteer vacancies that suit your skills and experience. Change your search engine. 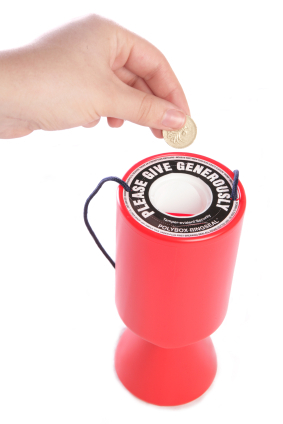 Most of us use search engines on a regular basis so this is an easy way to help charities to raise money without donating yourself. Check out the likes of everyclick.com to see the range of charities that you can support. Donate unwanted items. Wherever you live, chances are that there is at least one charity that would benefit from unwanted clothes, toys, bric-a-brac and other items that are still in good condition. Donate blood. If you’re able to give blood, you can make a big difference to someone’s life. Heck, you might even save one. Fundraise. Get others to sponsor you to take part in events to raise money for a designated charity. This can be as part of a big event like Race for Life to raise funds for a national charity or a much smaller event for a local charity. Donate your eBay profits. Once you’ve sold items on eBay, you can choose to donate some or all of the profit to a designated charity. Have a look at eBay.com/charity to see if your preferred recipient is signed up. If not, you can send them an invitation to register themselves. Donate your tax refund. If you’ve paid too much tax and are due a refund, you can choose to donate it to charity rather than keep it for yourself. While it’s easy to feel that your contribution isn’t worthwhile if it doesn’t come out of your own pocket, charitable giving comes in a range of different forms. Volunteering for an organization or helping them to raise funds can be just as valuable as giving money directly and most charities will be extremely grateful for your support. So, do you donate to charities? What kinds of methods do you use? We donate our unwanted items to charity and my wife volunteers. Since I work and am grad school, my time is limited (although, I just realized I find time for blogging – mostly really early in the morning and late at night) 🙂 This is a great collection. Giving blood is another great option. @20’s finances. We also donated our unwanted items. It feels really good to know that others can make use of the stuff. I am trying to have less unwanted items though. I know everyone is busy but I think that there is a solution for everyone- we can all help out in our own way. Some great tips here. We should always be on the lookout for ways to give back to your community. @Tushar. I think so. There are so many different things you can do. You just have to look for them. I really think there is something that would work for every situation. If I send money I have no idea how it might be used. But if I donate clothes, toys, furniture and other used household items, I at least can take comfort that somewhere, someone’s using them! That’s my favorite mode of charity that doesn’t cost me a thing! @MoneyCone. I totally agree. With some places you aren’t sure how your dollars are being spent- is it on administration or marketing or is it actually going to those that need it. I too would much rather donate items that can be used then to write a cheque. Glad to hear you have found a way to make a difference. We mostly give money right now. I was doing some research for a similar post and apparently people who volunteer at one point of time gave more financially too. I guess they really understand how much impact it can make. Even if we are giving money it is a great life experience to volunteer. I feel bad by just giving money we are taking the easy way out. @Suba. Don’t feel bad. Your contribution does make a difference. There are many different ways to help others and donating money is one of them. If you don’t have time at the moment to volunteer but you can still give cash, that is awesome. Maybe one day you will be able to volunteer, who knows, but know that what you are doing matters. Without your donation, things wouldn’t get funded. I like the everyclick.com idea. I did this with a similar webssite when I worked at a bank, but I never set it up in my home office. Gonna have to do that! @Christa. I think it is cool that there are websites like this where you can help out others. There aren’t enough of them though. Let me know if you get it set up and how it goes. Volunteering is a great way to give without spending money! In fact, a lot of charities could use more hands than money anyways. @Robert. More hands than money– I like that. You are totally right. In many cases charities need people to actually do some work and complete some tasks. My friend is helping out with the Mental Health Association here and this is exactly what she does- she hands out flyers and helps out at fundraising events. Her time is what they need. Regardless though of what a person can manage, any type of donation is awesome, whether it be time or money. @Steve. You’re right. Donating items is good but sometimes what people really need is your physical help and presence. I volunteer at a local teen clinic where I help out with issues like birth control and STI prevention. These teens really need someone to just sit down and talk to them and that is what I do. I know it can be hard to find the time sometimes but there are moments when we can give 30 minutes here and 15 minutes there. It all adds up and actually makes a difference. Don’t worry though, donating items is still a great help. Great tips. I donate unused items to the Salvation Army or Goodwill. Some credit cards allow you to convert your cash back into charity donations. Thanks! @Buck. We also donate unused items or items we are done using. I feel so much better doing that than throwing the item out into the landfill. I have heard of those charity cards. We don’t have as many of them here in Canada so my options for picking one are less but I should look into it. Thanks for the suggestion. We give via AmVets primarily. I also volunteer at company sponsored events like working at the “Boys and Girls club”, and “Habitat for Humanity”, etc. @Money Reasons. Good for you. Sometimes that unrecognized charity work is the most rewarding. I volunteer at a teen clinic where I help teens deal with issues like pregnancy, birth control, and STI prevention. Only the teen knows how much I help them but it is really rewarding. Great list Miss T! We give to our local food bank, the Red Cross and a couple others. I started making micro-loans through an online site called Kiva. The cool thing about Kiva is that donations are pooled to make loans to individuals or groups that have applied to Kiva through an NGO. I have made about six loans and they have all been paid back. I encourage others to check it out! @Paul. Thanks for sharing. I have heard of Kiva and thought about looking into it although I haven’t yet had a chance. I am glad to hear it is a reliable way to donate money to different causes. @Financial Samurai. Sounds like you have a good plan in place. I always feel good when I hear about the other charitable works people are doing. And yes sometimes you need take advantage of a situation. Your tips are excellent, and I would like to add two more. There is an organization that accepts unwanted or unused gift cards, or even gift cards that have only a few dollars left on them, and they then convert them into charitable donations. Its a great way to donate gift cards that you don’t want or won’t use. Also, several foster child organizations need soap, toiletry products, etc. for the children, especially teenagers they help. The ones you collect from hotels are perfect for their donation kits. Just be sure to check out any charity you donate to so that your donations actually go to those who need it. @Monica. These are some great ideas. When we have traveled to foreign countries we have often left toiletry items for housecleaning staff to take home to their families. It seems to work really well. We have also left toys and toothbrushes. I recently found out about Voucherry and signed up to see what’s all about. First, I had to complete the sign up form and choose my favorite cause. Now, at each purchase I’m making on Voucherry or from their partner stores, my favorite cause is getting a donation. I invited my family and friends too, because they support the same cause and for each of their purchase, a donation is made to the cause too. Now, I know that there are cash involved, but for daily, usual shopping that we do anyways. Seems that these days is very simple to do good. Sounds great. I am going to have to check it out. Thanks for sharing the info and for finding a way you can give back. Great list, we’ve donated a lot of childrens toys and clothes to charity in the past and also set up an appeal page on the blog for a young child in our town who had his legs amputated after contracting meningitis. You’ve made me feel I should do more though, I’ll definately consider donating my Ebay profits in future! I think you are already doing great. However, all of us if we are realistic, can probably do more. Donating your ebay profits is a great idea.